This entry was posted in Art and tagged Jean-Baptiste Chardin, Joaquin Sorolla, Vincent Van Gogh. Bookmark the permalink. Some of his favorite subjects were his spouse and children. It was obvious from his paintings that he loved his family. Ok I will look him up. Do you have anything over your sink? A window. I guess that would be categorized as “Realism”. 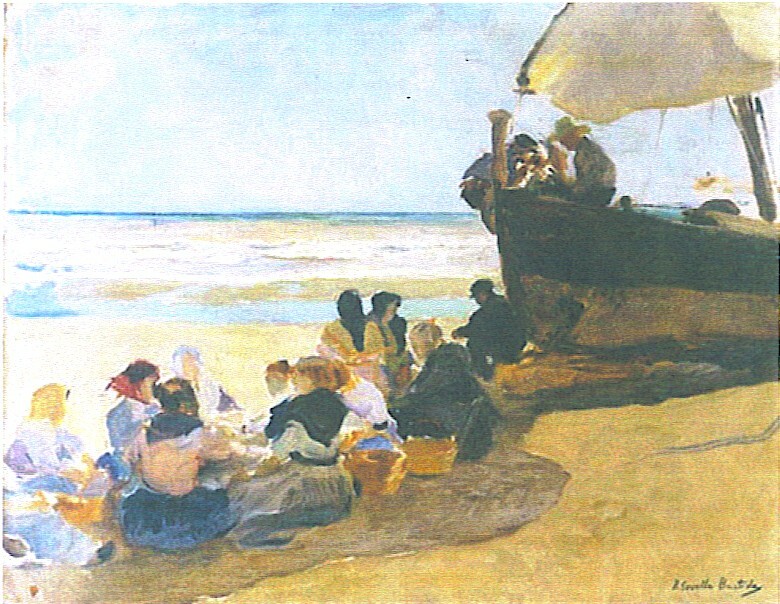 Sorolla is one of the most-admired painters by representational painters today. So, he’s been discovered by the artists; it might be just that the non-artists have yet to discover him. True. But it will probably take a major museum organizing an exhibition of his work to bring him to the attention of the general public. A first step was the show that the Thyssen-Bornemisza (Madrid) put together a few years ago, but if the Met or the Tate or the Orsay was involved, Sorolla would become a household name. I would love to see a major exhibition of his work in the U.S. I should add – and thank you for helping to bring him into the light for the rest of the world! Well, I don’t know about the rest of the world — but at least now there are a few hundred more people who know about Joaquin Sorolla. Thanks for your comments!. Your own work is excellent, Michael — I have been on your website and particularly admired the paintings of the American Southwest. I must say, you found some precarious places to set up your easel! Wow! I looked up Sorolla to see more of his work and was in joyful awe. Thanks for bringing attention to such a pleasure. I don’t know how I overlooked his work in the past, because lots of museums have Sorolla paintings — I think the Getty has several, in fact. During a vacation to Europe several years ago, one of our last stops was the Musee d’Orsay in Paris. Our visit occurred at the very end of our vacation and we made the common traveler’s mistake of trying to wedge too many events into one day. Our arrival at the Musee occurred about two hours before closing. As we perused the museum road map, we realized it was a triage situation. We decided to skip to the 19th century Impressionists. After viewing some minor and major artists of this period, I entered a room with four walls covered with Van Gogh works. Previously in classrooms, library and the Internet, I had gazed at reproductions of his many famous works. They are only ghosts of the originals. The luster and intensity of the room screamed with a vibrancy that was enhanced by the impasto style used in many of his works. As I regained my composure to take in one work at a time, I reflected. What is it that drives a man to passionately immerse himself in an activity where reward consisted of a handful of francs? With the net worth of these paintings, could France pay off a meaningful part of their National debt? Gosh, these paintings are naked-no glass. That one guard doesn’t look as if he’s got the moxie to prevent one of these jewels from being defaced. My mind whirled like the semi-circle strokes Van Gogh favored for some of his skies. As I exited, I made for another destination. When I was twelve, my family and I moved to France courtesy of the U.S. Air Force. My father was stationed in Fontainebleau at a NATO base. We took up residence in a petit village less than 10 miles away. Moret-sur-Loing is your archetypical picture postcard french village. Situated by a mostly well behaved river, the town dates to the 12th century. On the highest point of the city sits a cathedral named Notre Dame, a compact version of its much larger gothic neighbor 60 kilometers to the north. To this day, on many summer weekends you will find an artist or three painting from their chosen vantage point. About 1880, a certain Alfred Sisley took up residence in Moret. Failing to follow his father’s footsteps in business, he decided to paint and Moret was his last stop before he died in 1899. Like Van Gogh, he labored in obscurity supported for most of his life by a small allowance provided by son pere. Now, his works are found in the Musee d’Orsay as well as many other notable museums. Sisley is now regarded as one of the best plein air impressionist artists. I feel a special connection to the many paintings and drawings he created in Moret because I know the streets and locales from two years of living there. Dad’s subsidy was a good investment…just a bit early.